W elcome! This story is the sequel to my previous story, 'The Dark Empowerment', in the Battle for Power trilogy. This one is quite shorter than the first, it's around 65 pages altogether. Once again, the characters and locations are those from Zelda I & II and the cartoon (see other story for reason why). Erm, I'm messing around a bit with the original story of Zelda II, so don't email me saying I've got it wrong - I've changed it for convenience. Like I always say, this is fanfic and anything can happen. Yep, my little sister Kirsty helped me out again - Dion and Damon are her main storyline at the moment. Feel free to download all the parts or put them on your own page (yes please!). Simply click on the links below to read each chapter or download the zipped text documents. Things are starting to get back to normal in Hyrule. Link and his friends successfully destroyed the evil griffin Enzar and the King has recovered from his mysterious illness. The only problem is that before Enzar died, he shattered the Triforces of Wisdom and Power into hundreds of pieces, never to be seen again. 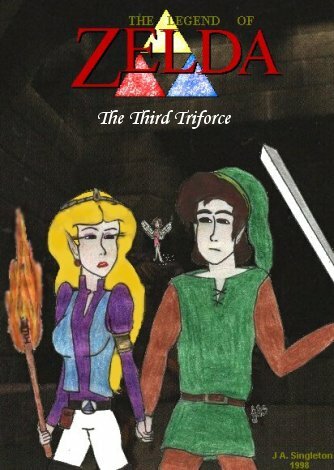 Ganon plans to hunt out every single piece and restore the two Triforces, unknown to Link and Zelda, who have given up hope of ever seeing their Triforce again. Meanwhile, Zelda and her Father are visited by two old family friends, Lady Fenella and her daughter Fayette. Felicity, a friend of Sprite then discovers some old scrolls relating to the last remaining, but hidden Triforce - Courage. This page was created by Juliet A. Singleton © 1998 -2006. All rights reserved.